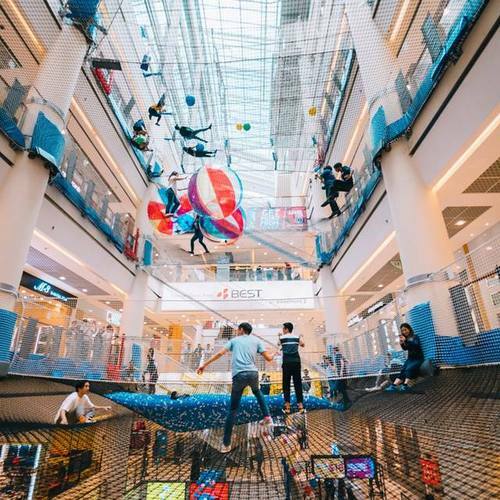 “Suspended playground” concept AIRZONE is located within Singapore’s City Square Mall, at 180 Kitchener Road. As a theme park attraction, AIRZONE has been constructed as a truly unique experience for the young and old alike, being the world’s first “suspended playground”. AIRZONE offers an elevated playground with distinct themed zones that contain unique games to explore, including a Ball pit, Slide and 3D Maze. The attraction occupies the atrium space of City Square Mall shopping mall in between the floor levels, stretching up to level 6 with fun and excitement for all the family on every level. Naturally, safety is at the heart of AIRZONE’s operations, from their trained crew on site through to their experienced management team. As an AIRSTRONAUTS, you only have to worry about one thing, having fun. To enter the attraction, you can do so from Level 2 at City Square Mall, Little India. The official Facebook page for AIRZONE Singapore is located at www.facebook.com/Airzonesg. Following the Facebook page, you’ll learn about the AIRZONE services, their promotional offers, events, and much more.